The Rev. Dr. Lisa Culpepper recently returned from an Outreach Foundation trip to Lebanon, led by Associate Director Marilyn Borst. Some people say that Jesus passes by…. while the dough is rising for the “awamet.” It was Baptism of the Lord Sunday in Tripoli, Lebanon (a city of sweets) where the syrupy “awamet" (meaning, “to rise out of the water”) pastries were being passed around. As the platter was quickly emptying we were told that this traditional sweet is served in celebration of baptism. The dough, which is made the night before, is left to rise and later formed into small balls which are fried in hot oil. Watching them sizzle and skip in ‘baptismal’ oil, they float to the top, rising to new life, and a drizzle of syrupy sweetness. Tripoli was a place that had been off limits in my mind’s travel itinerary for the first six years of the Syrian war, as I journeyed in and out of Lebanon on mission. This was the case until this trip, when I was asked to preach in the Tripoli Evangelical Church (one of the many Reformed and Presbyterian Churches of the Near Eastern Synod of Syria and Lebanon). Considering this an honor, I did not want to entertain thoughts or questions about whether or not this was a safe place to be. Over these years, I have found that traveling to the Middle East elicits one primary response from family and friends. “Is it safe? Stay safe,” they say. With a word of thanks and a smile, I pack my bags quickly and taking advantage of every bit of the 50 pounds allotted, I occupy my mind with tissues and toothpaste, so as not to entertain the question, “Is it safe?” Yet, there was another question that I did invite into my consciousness, “How does the church worship in war?” This was the question that preyed upon my mind from Charlotte through Dulles and from Frankfort to Beirut as I traveled to join a team of eight with The Outreach Foundation. Our mission was to visit churches in Syria and Lebanon, to meet with church leaders and to encourage and support the church in this difficult place. In preparation for the mission and solace for my fears, I turned to the Psalms where I can usually find comfort. Yet when I turned to Psalm 29, I found not a voice of comfort, but of dread. It was the words of the Psalmist, not my impending journey, that sent chills down my spine. In this text, the Psalmist paints frightening images of God’s voice, using hurricane force winds which reduce Lebanon’s cedars to firewood, strip forests bare, and turn mighty oak trees into well-honed spears. In the reading, my mind revisited the destructive winds of hurricanes Matthew and Hugo that encircled my home some years ago, snapping tree trunks like match sticks and uprooting forests like a fist full of garden weeds. And in the midst of the fury, Almighty God, like a Gilgamesh dragon breathes out fire and shakes the wilderness of Kadesh. Safe? I was definitely not safe for in the solitude of my devotion, I was in a more dangerous place than the churches I hoped to visit. The imagery in the reading evoked a more furious danger within the church than outside her doors. The text revealed that the power of God to create and to destroy is far greater than any opposing force. Yet, it was in the solitude of my devotion that I discovered the answer to my question, “How does the church worship in war?” The church, in fearful imagination, ascribes to the Lord glory and strength, worshiping him in holy splendor (29:1,2). And in this worship, the Lord gives strength and blesses his people with peace (29:11). The church worships a God who is mightier than missiles, more powerful than exploding ordinances, who provides strength and peace for his people. 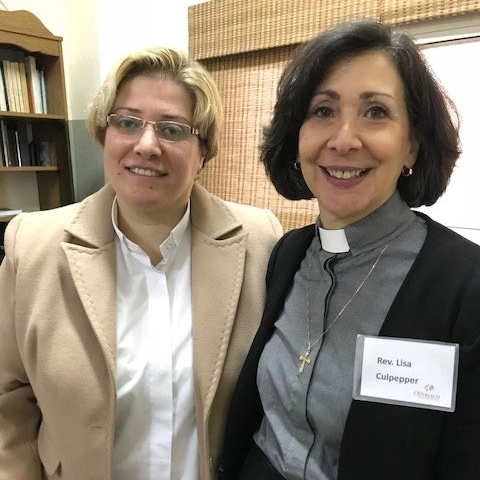 Having remained in Tripoli throughout the Lebanese war and the Syrian war, Pastor Rula Sleiman’s life has been changed by dangerous encounters. Rula told us about the time she was escorting preschoolers across the street when the black signal flag of impending sniper fire was raised. In an effort to shield the children from alarm, she remained calm and quickly moved them into her car. When asked how living through the war has shaped her life, she answered, “God has strengthened us and given us hope. We trust in God to protect us. We can face anything now.” Yes, Pastor Rula has encountered a dangerous God and she will never be the same. In response to my visit with Rula and other church leaders, I am convinced that when the dough is rising for the awamet in Lebanon and Syria, the Word which became flesh not only passes by, but stops to enter and to dwell among the faithful church as she fearfully yet faithfully remains in dangerous places. For out of her worship emerges a much greater power than war. Out of her worship emerges a balm for the injury of war, a comfort in pain of war, a peace in the fury of war, and a light in the dark night of war. Mark Labberton, The Dangerous Act of Worship: Living God’s Call to Justice, (Downers Grove: Intervarsity Press, 2007), pp. 63-64.